What we believe turns out to be a major contributing factor for whether we can achieve the optimal outcome that is the most reasoned and resonant extension of our principles. Accomplishment is not simply a story of good fortune or of hard-work; success is not victory in a mortal struggle between opposite forces… achievement in any true sense is thriving, and thriving that resists the ravages of time, error and disinterest, is about confluence. Throughout recorded human history, the idea that we are competing to the death against all of nature for a chronically limited supply of all of life’s underpinnings has prevailed. As a result, we have organized ourselves around access to scarce but urgently necessary resources. 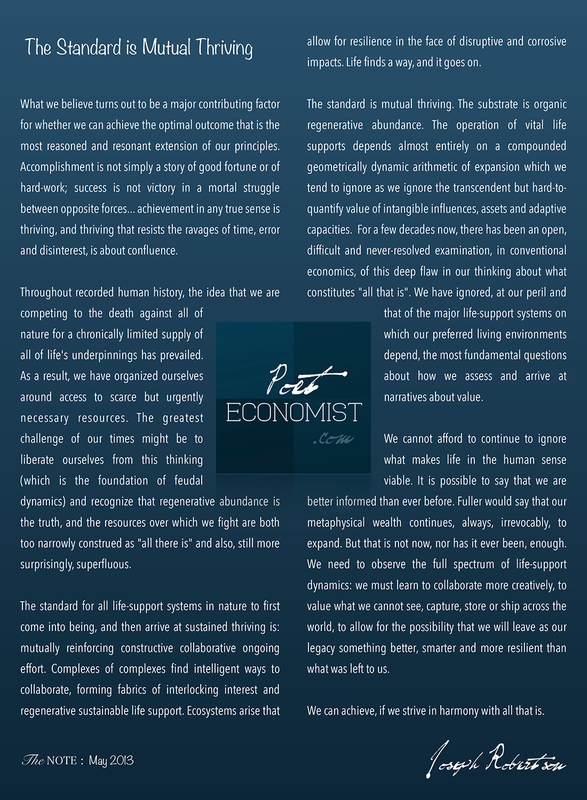 The greatest challenge of our times might be to liberate ourselves from this thinking (which is the foundation of feudal dynamics) and recognize that regenerative abundance is the truth, and the resources over which we fight are both too narrowly construed as “all there is” and also, still more surprisingly, superfluous. The standard for all life-support systems in nature to first come into being, and then arrive at sustained thriving is: mutually reinforcing constructive collaborative ongoing effort. Complexes of complexes find intelligent ways to collaborate, forming fabrics of interlocking interest and regenerative sustainable life support. Ecosystems arise that allow for resilience in the face of disruptive and corrosive impacts. Life finds a way, and it goes on. The standard is mutual thriving. The substrate is organic regenerative abundance. The operation of vital life supports depends almost entirely on a compounded geometrically dynamic arithmetic of expansion which we tend to ignore as we ignore the transcendent but hard-to-quantify value of intangible influences, assets and adaptive capacities. For a few decades now, there has been an open, difficult and never-resolved examination, in conventional economics, of this deep flaw in our thinking about what constitutes “all that is”. We have ignored, at our peril and that of the major life-support systems on which our preferred living environments depend, the most fundamental questions about how we assess and arrive at narratives about value. We cannot afford to continue to ignore what makes life in the human sense viable. It is possible to say that we are better informed than ever before. Fuller would say that our metaphysical wealth continues, always, irrevocably, to expand. But that is not now, nor has it ever been, enough. We need to observe the full spectrum of life-support dynamics: we must learn to collaborate more creatively, to value what we cannot see, capture, store or ship across the world, to allow for the possibility that we will leave as our legacy something better, smarter and more resilient than what was left to us. We can achieve, if we strive in harmony with all that is.